Mobile devices are becoming more and more frequent in both the office and home environment and as such, we need to consider the implications and best practice for DSE when using these. In 2003 the DSE regulations were updated to include the changes in technology, improved understanding of risks and how to control them, but the main messages about the steps employers and workers should take to identify and prevent risks altered very little. The 2003 update reflected the increased use of laptop computers, referred to as “portables”. It made it clear that the regulations applied to portables in prolonged use. But the DSE regulations were always at odds with “portables”, for good ergonomic reasons. By advising against their use for prolonged periods without what amounted to either a full docking station in the office or a portable docking station when travelling about, suddenly the “portable” was rendered not that portable at all. There are no specific mobile devices named in this amendment other than laptops however, it is implied that mobile devices cover any work based equipment that is relating to technology. 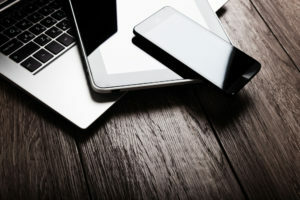 The selling points for these devices are ease of use, fast Internet connectivity and the availability of a huge number of different applications (apps). These applications include many that very clearly target a working audience. With the capability to work anywhere with a Wi-Fi or a mobile signal, it is no surprise that employees expect to use their tablets and smartphones for work. The practice is becoming popular enough to have led to the term “bring your own device” to describe it. There are applications (many of which are supported and paid for by employers) that enable employees to use their own devices for work, such as securely reading and editing documents, reading and writing e-mails, and viewing contacts and calendars on a secure work account. Employers also need to consider very carefully whether any risk assessment to portable devices is required within their organisation. They need to consider how and when these devices are being used, which will not be easy given the mobile nature of the workforce. The fact that the equipment is not used for “lengthy or repeated use in the same location” may negate the need to record the assessment. • advice on how to minimise risks from theft or mugging. The possible risk factors associated with tablets, smartphones and working on the move are mainly those leading to musculoskeletal problems, visual fatigue and stress. The likelihood of experiencing these is related mainly to the frequency, duration, intensity and pace of spells of continuous use of the equipment, in conjunction with factors such as how much discretion the person has over the extent of their use. Assessing the devices could be very difficult, one solution could be to limit what employees can do with their tablet if it is provided by work. Tablet and mobile working is on the increase and is here to stay. Employees like using mobile technology, they are potentially more productive when using it and it frees them from being tied to a specific desk. As working practices continue to evolve, providing a dedicated workstation for each employee is starting to look a little inflexible and rather expensive.